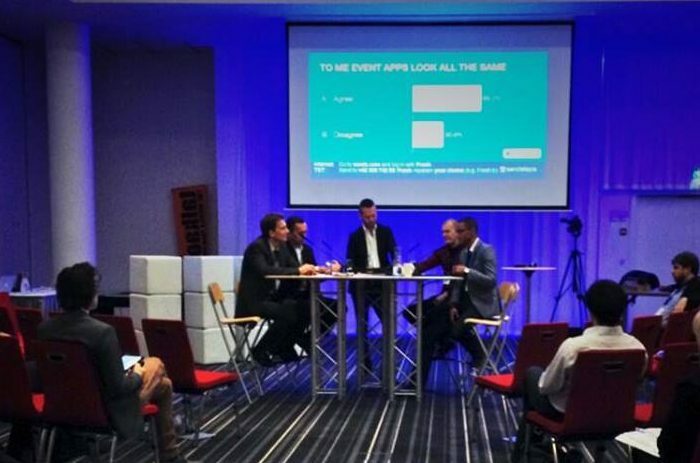 During the 3rd edition of the FRESH Conference – an international meeting for event professionals – Sendsteps sponsored an interactive talkshow of which I was the presenter and host. Together with event app developers [SpotMe, DoubleDutch, WhalesOnWhaves, EventMobi, SuperEvent and Twoppy] I talked about the current use and the onward development of event apps. I did so in the form of a table interview. Instead of just talking out and about, I structured the talk by discussing a statement every 15 minutes [the talkshow lasted an hour]. Those statements were formulated in advance and together with the event app developers. Before the table guests could react themselves, I first asked the audience to vote through Sendsteps. Based on the audience response I only then asked attendees to react on the outcomes. This gave a nice dynamic to the discussion and as such time flew by! Since most of the audience attendees were event professionals, I constantly asked the audience to interact along. Not only through polling, but also with open live and digital comments. They were the ones with lots of experience, the end-users of event apps. Their experience, critical feedback and best practises helped to shape a valuable discussion. Based on their input, the several event app entrepreneurs were able to take back home valuable data for onward product development!